A Buckinghamshire pensioner who lives close to the proposed HS2 high speed rail route has been told her house is worthless - months after it was valued at £275,000. 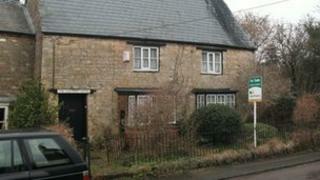 Elfrida Harper-Tarr, 97, needs to pay her care home costs by selling the property in Turweston. But a buyer pulled out after their mortgage lender valued the house at £0 because of its proximity to the route. Ms Harper-Tarr's family is applying to HS2 Ltd's Exceptional Hardship Scheme. The pensioner was living in Turweston's Old Post Office, where she used to be the postmistress, until she went into care in August. Her family said she is paying £3,500 a month for care and the money will run out in three months. The house was due to be sold privately last year and is currently on the market with an estate agent for £275,000. Mike, her 76-year-old son, said: "It's going to be a bit late in the day for a lady who is blind and totally relying on carers to keep her alive. "You're faced with needing someone who is willing to pay cash and does not require a mortgage. "This is going to be repeated up and down the country because people aren't going to rush to buy a house near the HS2 route." Lizzie and David Babister made the private offer on the house last year. However, Woolwich turned down their mortgage application after valuing the house at £0. In its decision, the bank said: "In the future there will be disruption during the construction of the rail link and there will be ongoing impact ... affecting the quiet enjoyment of the property. "The [HS2 proposal has] had a significant prejudicial affect on property in the village and none have been recently sold on the open market. "This property is therefore not considered a suitable security for normal lending purposes." The mortgage-lender also said the decision was based on the condition of the property which was in need of total modernisation and improvement. The Babisters, who wanted to move from their house in the same street in Turweston, also had an application to re-mortgage their current house turned down by another lender. Ms Babister said: "We're stuck in our house for the next 15-20 years because it doesn't look like we'll be able to sell in a blighted village. "We've effectively lost our freedom of movement and the government should reconsider the compensation mechanism, so that people in blighted areas have access to mortgages." HS2 Ltd said the government had set up property compensation schemes for house owners. The Harper-Tarr family is applying to see if the company will buy the house or provide compensation. Construction of the London-Birmingham section of HS2 is expected to begin in 2017 and be finished in 2026.